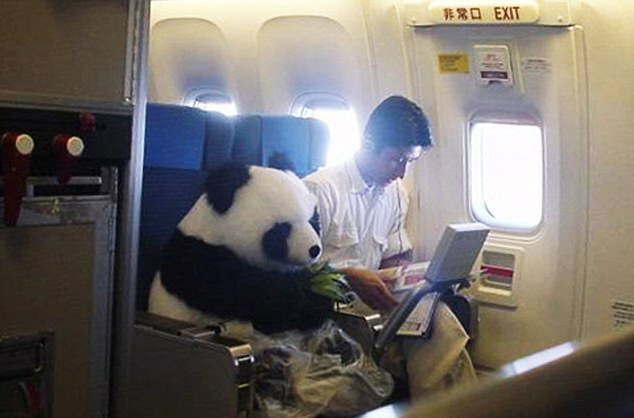 What if instead of a human passenger a giant Panda walks in and sit next to you in your flight from China to America? Would you be scared to hell or just sit next to the Panda calmly reading a newspaper or chatting on your laptop? Well recently, a shocking photograph of a panda bear flying business class on a China Airlines fight has been shared by thousands of mesmerized and astonished viewers online. 'When you look at this photo you might assume that you’re seeing a man on an airplane seated beside a big plush panda. But guess what, that’s not a toy. That’s a real live panda cub and he’s flying first class,' website Geyser of Awesome posted with the photo on Saturday.